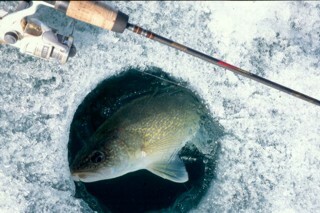 In the coming months some of the biggest walleye of the year will be caught, through the ice, in water so shallow it’ll scare you when they bite. Just ask my good friend Derek Nyrose. 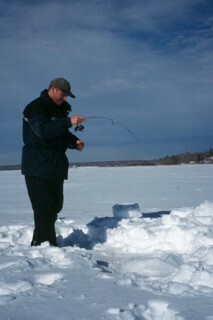 He came to Alberta from Vancouver on a work assignment and took a day off to go ice fishing on Calling Lake with me. After looking down the hole and breaking off on a large walleye early in the day he jumped to his feet motioning with his arms to indicate how big the fish he was now seeing down the hole. At this point his eyes were as big as saucers but he managed to settle down and stick the next few bites including a 7 pound beauty and then a 9.6 pound monster. Talk about beginners luck. This was the first day he had ever fished for, let alone caught a walleye. I couldn’t complain either as I caught a 7 pound beast myself and our friend Larry hooked a few beauties himself. Calling Lake is a real producer of monster walleye through the ice. Catching a big walleye requires a bit of luck, but starting late February, early March through to the end of the season the chances of tagging a real monster become better and better. It’s all about persistence, patience and that little bit of luck. I’d like to tell you that if you want to catch a big walleye, just put on a whopping big herring on a tip up line and they’ll come. Unfortunately big walleye don’t seem to work that way. Instead, using that same lead head jig and minnow that has caught walleye throughout the year will catch the big ones through the ice. What it takes is the ability to do work and the willingness to fish around their schedule. It’s all about being on the ice and fishing when the fish are feeding. Walleye are for the most part low light feeders, so you want to be on the lake and fishing before sun up and after sun down. That means being on the ice and getting set up in the dark for the morning bite. Both sides of the light equation are equally good in bringing walleye in shallow to feed. The next thing I do is to set up near areas I believe walleye will congregate as they start staging for the upcoming spawn. Walleye spawn after the ice melts so it only stands to reason that they will move progressively closer and closer to these spawning areas like creeks and rivers as the season gets later. This concentrates large numbers of mature fish in predicable locations. Near these spawning sites, I fish off points and on the flats. Fishing the areas near these primary spawning locations substantially increases the chances of catching a big walleye. One such example that comes to mind is Slave Lake. 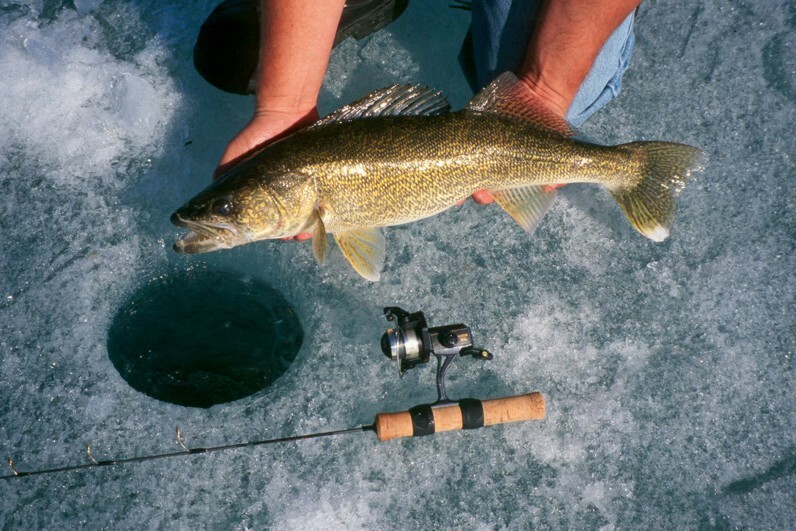 Nearly 80 percent of all the walleye move into the Heart River, located at the extreme western end of the lake, to spawn. 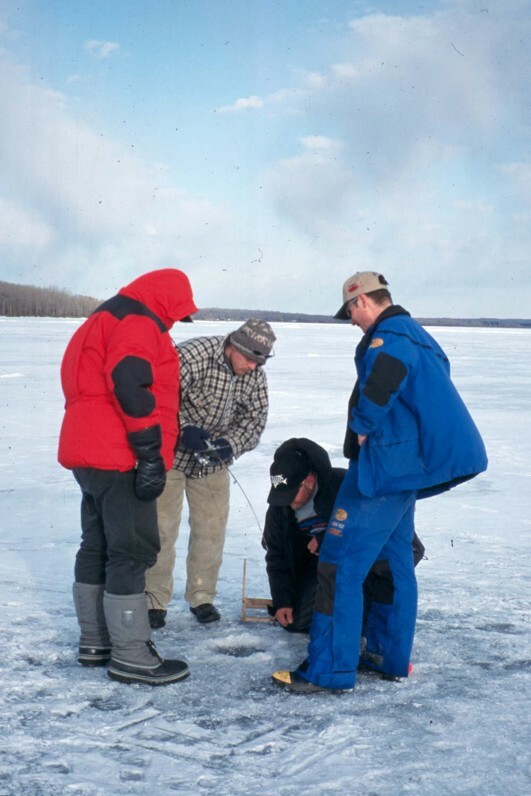 Anyone that fishes Slave knows that in the late months of the ice fishing season all the points and bays near this area will be full of walleye. As for daily movement patterns, look for walleye deep during the day and pushing up shallow during low light. 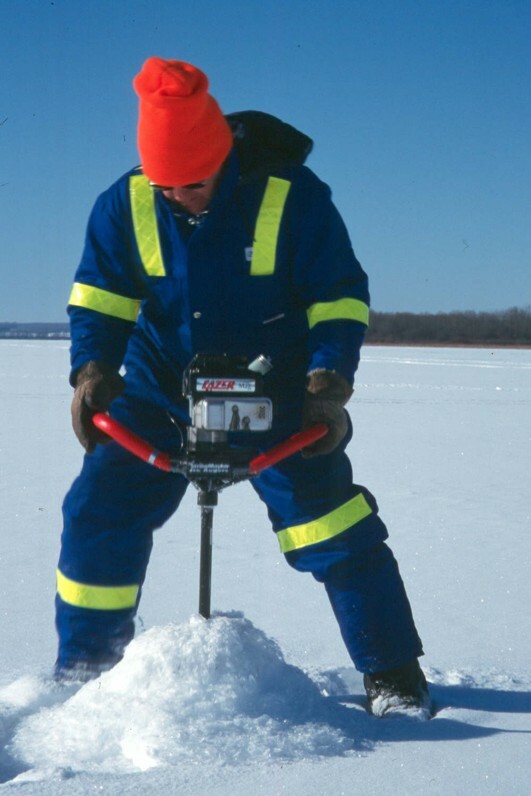 I had mentioned that work was an essential part of catching big walleye and it comes into play drilling the numerous holes required to effectively fish an area. I suggest you do all the drilling for the day at the onset. This may mean drilling a few dozen holes. Drill a pattern of holes from deep to shallow and back again which should ensure all depths are covered. This allows you to follow their movement deeper or shallower once the bite is on without disturbing the fish. I have seen walleye turn off immediately when someone in the area fires up an auger and starts drilling. I make every effort to avoid this. When it comes to chasing walleye, I have found good fishing results at Pigeon, Lac St Anne, Isle and Calling with most of my biggest walleye being caught at Pigeon or Calling. This certainly is not an exhaustive list of good walleye lakes, but they are the better lakes around where I live and the ones I fish most often. 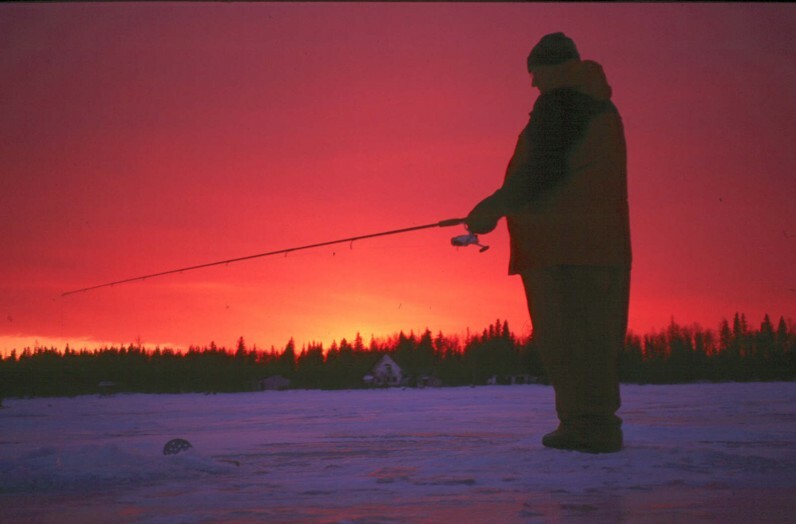 Make the effort to fish the low light periods and fish in areas where walleye will be staging for the upcoming spawn. Do this and you to will be connecting to big walleye.